A discernible effort to racially integrate the coaching staff, which had been all white since 1898. 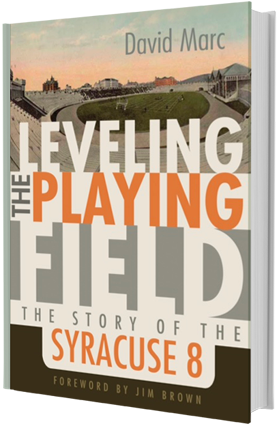 David Marc, the author chronicles this contentious moment in Syracuse University’s history and tells the story through the eyes of the players who demanded change for themselves and for those who would follow them. We, the members of the Syracuse 8 LLC, have joined together in the mutual enterprise for the purpose of making a contribution to the advancement of humanity by facilitating scholarship and education. We will establish an educational initiative to provide increased quantity and quality of learning opportunities, and exposure to benefit our youth. Uncover the truth from extensive interviews and get a first hand account of the boycott that ultimately leveled the playing field. "This book is a must read. If there is only one book to read this year, this is it." "Marc takes us beyond the often cliche-filled lore of sports history as he artfully reconstructs a little-known but fascinating episode in the continuing struggle against racial discrimination in collegiate sports." "The story of the Syracuse Eight would not have been complete without this book."